We had an interesting start to a wonderful weekend. With both my birthday and Valentines so close together, I decided to surprise my family by renting a large cabin in the Smoky Mountains. I invited my brother and sister in law, their two children, and my mother and father in law for a big old Southern family getaway. To make it even more special, we kept it a secret from the kids and I spent weeks imagining their surprised faces at finding out where we were going and being greeted by their cousins and grandparents upon arrival. I’d been looking forward to the weekend for quite some time and was thrilled when I was finally able to pack us up. As soon as Ricky got off work Friday we loaded up the car (dog and all) to head towards Gatlinburg, not telling Brady and Katy Rose until we were well on our way. About two hours into our drive we realized that this winter storm was something we weren’t going to be able to ignore. Long story short (how often do I do THAT on southern plate?) we had to turn around and come back home. Although Ricky’s parents had managed to reach the cabin, the road leading to it’s perch atop the mountain had since become covered in snow and ice and they were relying on hope and sun to be able to get down the following day. Ricky’s brother and his family had to turn back and go home as well. The kids were heartbroken and we made the ride home in silence and tears from the peanut gallery in the back seat. The bright sides of this situation were obvious: We were lucky we weren’t stuck on the mountain and we were fortunate we weren’t on roads we could easily have a wreck on. Still, I have to admit, I’d much rather have been in that cabin on a mountain top looking out over the snow. I hid my disappointment as the kids vented theirs and one thought kept reverberating through my mind: our little weekend getaway wasn’t going to happen and there were no refunds. We would never get those three days back. Then a question came to me, how were those three days any different from any other three days? No matter where we were, at home or in a cabin on a mountain, there were still no refunds on this weekend. The next day I woke up with renewed determination. While we didn’t get to spend time together in a cabin, we still got to spend it together. We took the kids to Birmingham for the day and spent our time at home helping Brady earn a new boy scout badge. We made brownies and shopped for groceries as a family. In between, the kids petted the dog so much it’s a wonder she doesn’t have bald spots, and we had a nice little time in our warm little house. As a result of our weekend I awakened to the first hand realization that whether you’re at home or on vacation, each day is a one shot deal. Instead of pining for a view from someone else’s window, take a moment to appreciate the view from your own. We may not be in a rented cabin, but that doesn’t mean we can’t spend just as much quality time with our children in our own living room. Make the most of today. Use it up, wear it out, squeeze every last ounce of “good” out of it. Even if you aren’t financially vested, There are still no refunds. Yesterday we talked to the cabin owner and she graciously offered to let us schedule two more nights to replace the ones we were unable to use. Ricky’s parents also made it down off the mountain in one piece thanks to a patch of rain that temporarily cleared the roads, and I came out of this with a priceless bit of wisdom. That’s money well spent either way you look at it. Today begins my week of meals planned by Brady as part of a Boy Scout project. When I asked him to write down five things that he would like for supper this week, someone on twitter said “Ten year old boy planning meals? Get ready for pizza all week!”. I was expecting that as well but have to say I am very impressed with Brady’s choices and really looking forward to supper each night. Some things he chose are already on SouthernPlate.com but I’ll be posting tutorials for the recipes we use that aren’t as the week goes on. BUT hang in there, I’m bringing you the SECOND Way in this post! Hey, it’s quick, easy, and delicious. Ain’t no shame in my game! The second way is the one I am bringing you today, from scratch. Now this recipe has a wee bit of heat to it. Brady and I enjoy it immensely just as is but Katy Rose won’t touch it. She only eats the dirty rice made from boxed mix. 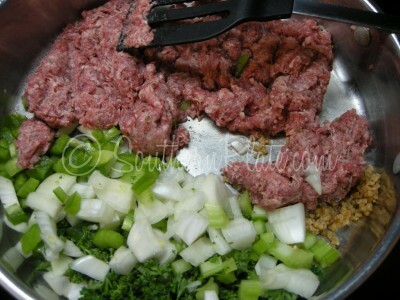 If you’re feeding this to younger kids or those who don’t care for the spice, you can cut down a bit on the seasoning and use ground beef instead of sausage. When I say “heat” I’m not talking about “oh my goodness this is so hot” I just mean it leaves a little zing in your mouth and is divine served with iced tea. Note to all Texans: I realize these references to heat will be laughable to you and you’d likely have to spice this up with jalapenos just to get your newborns to touch it. I’m just laying it out for folks not from your parts. 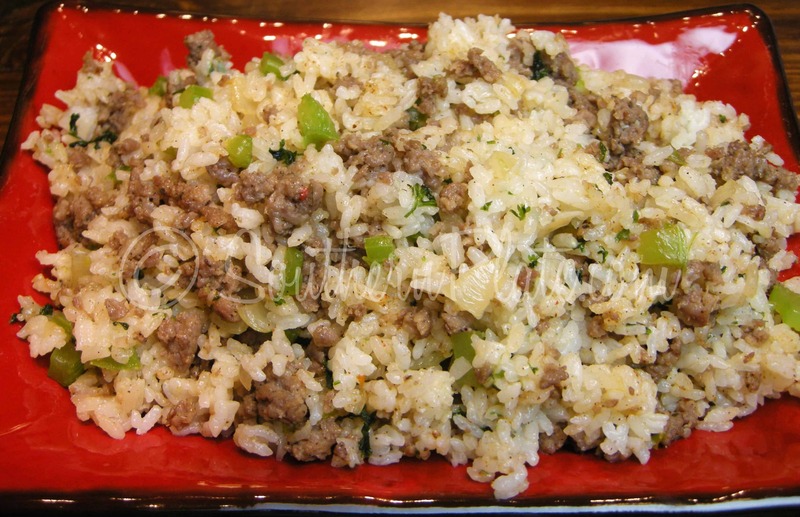 You’re going to need: Cooked rice, Creole seasoning, parsley (fresh or dried), onion, bell pepper, sausage, celery, and some chopped or minced garlic. Now y’all gotta sing with me. Of course, the Tennessee Pride folks don’t know me from Adam so if y’all know anyone who works there, tell ’em I said “Hidy”. 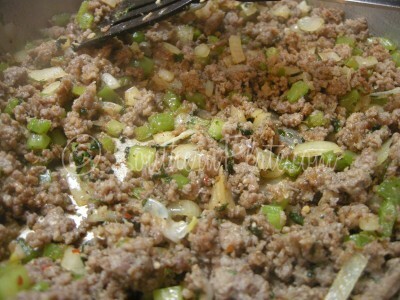 This photo shows chopped bell pepper, celery, parsley, and onion. 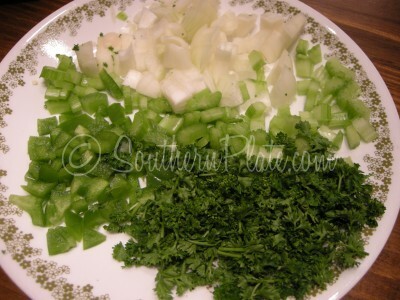 What we’re seeing here is known as “The Cajun Trinity”- three essential ingredients in seasoning a variety of Cajun dishes: Onion, Bell pepper, and Celery. Parsley and garlic are perfect accompaniments to the trinity. You can use dried parsley which would have been my first choice if Wally World hadn’t of been out of it. They were also out of Chili Powder and a few other things on my list. ~blinks~ Whats up with that? Place your sausage and vegetable type thingies (I’m gonna use that term to encompass veggies, herbs, whatever) in a large skillet. Pictured here: Garlic, onion, bell pepper, celery, and parsley. 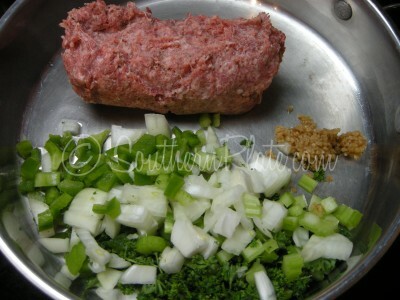 Chop up your sausage a bit and cook that over medium to medium high heat. I use medium high because I’m impatient. Folks always talk about how patience is a virtue, well I think impatience is every bit the virtue patience is and more, because impatience gets supper on the table a whole heap faster. It’s gonna look kinda like this when it’s almost done but we need to keep cooking until all of our veggies are tender. Celery tends to be a bit stubborn at times but heat and your determination will eventually triumph. 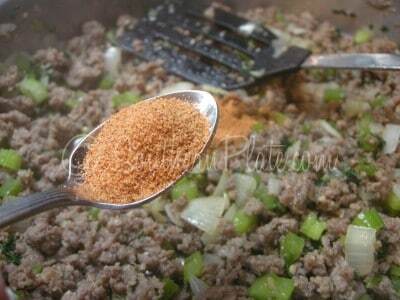 Add your creole seasoning. I use two and a half tablespoons and LAWDY is it ever good. You might want to cut back for starters though. Stir that up good and make sure your rice is heated through. Sit down with a glass of iced tea and a proud ten year old. Thank the good Lord for Cajun cooking! 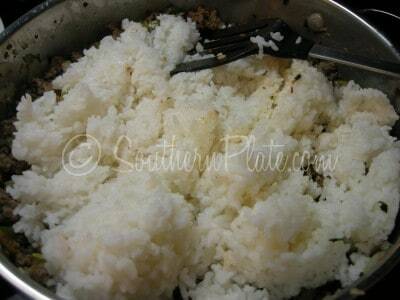 *For the Creole seasoning: Start on the low end and add more after the rice has been stirred in if you like more seasoning. This adds the spiciness so you want to do it to your personal taste. If you're a Texan, just toss the whole lot in and laugh at how wimpy the rest of us are. If you're a Cajun, please call and give me directions to your house - I like to eat :). No one cares what you know until they know that you care. ~Submitted by Berta. Join the rest of the family and submit your quote here. Jordan Cinnamon Love Knots – Take Pride In Your Laziness! Tender Roast and Veggies – We’re Movin’ On Up! A woman after my own heart!! Personally I would have used about four times the amount of creole seasoning but that’s because I like spicy hot foods. hehe Good choice on the brand IMO…Tony Chachere’s has never disappointed me. I can add a little and get full flavor without the heat or I can add a lot and get the heat without the flavor being overbearing. Thanks for another great post and an enlightening story on how valuable our days really are. I hope the rest of your weekend went well and that you made the most of it. 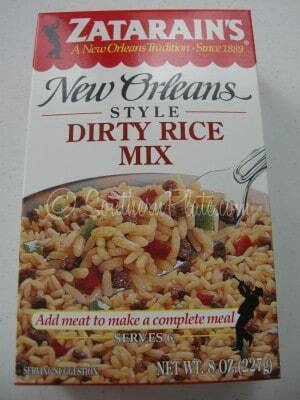 Being from Cajun country (south of New Orleans) I’d have to say you make one mean dirty rice recipe! 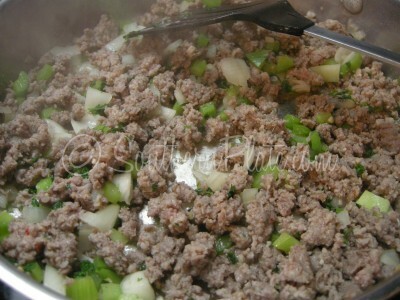 The only thing I do differently is that I add ground beef along with the sausage…mmm mmmm ces’t se bon! Sorry about your weekend, but glad you can reschedule. Soometimes you just cant compete with mother nature. We got 11 inches of snow in dallas and that has never happened. It was the most snowfall in one single day in 30 years crazy!!! 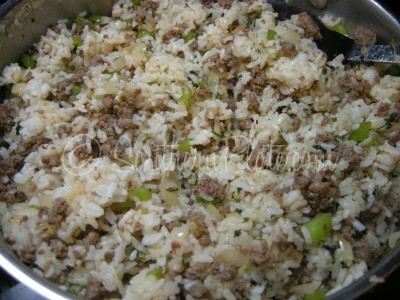 Dirty rice is my fave so i will be making this soon. Yum! Bein’ a Texan and a Cajun I just want to say that your dirty rice looks just like my Meemaw’s from Crowley (Acadia Parish), Louisiana! And you can’t beat old Tony Chachere’s seasoning either! I was born and raised in South Louisiana–my mom’s maiden name is Benoit. I make this often–it is so easy and good. One year my daughter had to make a potluck dish for the Christmas lunch in her classroom and it had to be a dish about her heritage. I used red and green peppers to make it look more festive. She is 20 now and still talks about how her dish was the first one emptied–she said everyone wanted it. I will have to try this. As a Texan, yes, gotta have more heat. As someone who is getting older and can’t handle the spices.. It’s just fine the way it is! I feel your pain about the weather. We were pretty much stuff all weekend here at the house. Couldn’t make it to the circus. Karate Banquet was cancelled and while they have been calling for another storm to hit last night THANK GOODNESS it missed us…because I have a terrible case of Cabin Fever and we were gonna run outta toilet paper if we couldn’t get out soon. ok, so we weren’t stuff, we were stuck. I apparently need another cuppa coffee today. 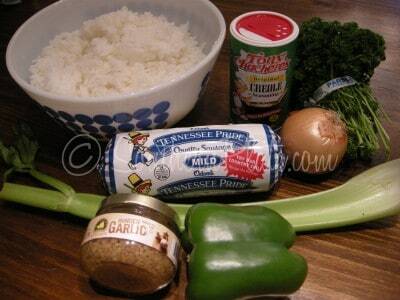 I am so excited to try this recipe, I love dirty rice! It looks so easy and good. We got 4 inches of snowfall here in middle Ga and my 2 yr old son loved it, we were all excited! I had the same fear when my (then 16 year old) son was designated the ‘food planner’ for an 11-day canoe trip for 20 people to Biscotassing, Ontario, Canada. He took the opinions of the boys, and the leaders, and worked something up. Mind you, they had to canoe all of the food in, along with their gear. The closest ‘general store’ was a 10-mile canoe trip away, and it didn’t carry that much stuff. There was limited water supply (they had to purify everything they used in meals/drank), and NO refrigeration … except any coolers they would choose to take in the canoes. MY biggest fear was that the HUGE bags of rice and flour that they decided to take (Econo-club 20 pounds!) would be in a canoe that would upset — they decided that they didn’t want to put into tuppers. [They also took powdered milk, powdered ‘bug juice’ and similar.] They made fresh bread every single day! I find it impossible to keep house without Tony’s. DD # 4 went to college in far east Texas (30 miles from Shreveport) and her cajun roomies got her hooked on it too. My dirty rice is different, it’s baked with mushroom soup, turns out “wetter.” this sure sounds good though! btw happy late birthday, you and DD# 4 share the same b-day. 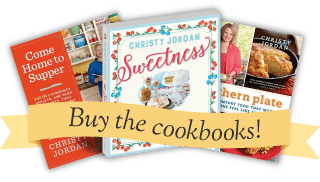 Growing up in Pittsburgh, I’d never heard of or tried Dirty Rice until I moved to South Carolina and took my first trip to Bojangle’s… I was more enthralled with the rice (and the sweet tea, oh, boy!) than the chicken! Soon after I grabbed a box of Zatarain’s from the grocery store and made it with ground beef, and our family loved it. Now I can’t wait to try yours. Just reading it made my stomach growl, and I didn’t even read it out loud (how the stomach and the reading/comprehending part of the brain communicate is a mystery). I’d much rather make from-scratch than from-box because you don’t get all that extra salt and all those chemicals that no one can pronounce. I think I’m gonna make a special Walmart run just to grab up the ingredients and whip it up tonight. You definitely da bomb, Christy. Good grief! I probably passed you somewhere out there in Birmingham! We spent the day there Saturday doing that shopping we just can’t do close to home! Did you happen to see a woman walking through Target pretending she wasn’t with the crazy people surrounding her? Hee hee! The traffic was at a stand still all day, so we shopped and went to a movie to wait it out. Hope you made it out of town and missed the traffic jam! I love dirty rice! When my husband goes to Popeye’s for chicken, I prefer the red beans and rice or dirty rice! Sorry you didn’t get to have your fun birthday weekend! I hope you enjoy your makeup trip better. All of us in North Florida kept anxiously waiting for the promised snow to come, but it didn’t quite make it this far. Just cold, cold rain! Some people drove up to Alabama to see it! I can’t wait to try this. I normally use the Zatarain’s version but this looks great. Thank you also for the story, we all need a jolt like that from time to time. Hope you had a wonderful birthday and Valentine’s day! Love your recipes. I can relate to your attempt to stay in the Smokies last weekend. I rented a cabin for the first week of January, as my family was coming to AL to visit. Our cabin was beatiful and perched way up on the mt. We prayed everymorning as we slowly drove down, there was a dusting of snow which never melted. We stayed at Amazing Grace rented by Timbercreek rentals. So sorry about your weekend. But, grateful that nobody was hurt driving in the storm. I’m originally from Denver, Colorado so I’m very familiar with bad storms. Hope your next try is successful! Can’t wait to try this Dirty Rice. Sounds wonderful. I wish I could hug you!! You are so sweet and thoughtful. I love the disclaimer you addressed to Texans and Cajuns. Too cute. How could anyone chastise you based on authenticity with that kind of disclaimer? Oh my goodness! That Tennessee Pride commercial brought back memories of my childhood here in Nashville! I was singing along with it–even in the exagerated Southern accent! Thanks for a blast from the past and a great new recipe to try! I’m originally from south Louisiana, but I don’t make dirty rice to often, but I do make jambalaya and gumbo. And your welcome anytime, Just drive north about 30 miles! I cried. I’m pretty sure they were tears of joy for the newfound realizations that you had about each day being “non-refundable”, but like an idiot, I just sat here crying. I love you and your family and your site and the wonderful stories and recipes that you bring us! You are so wise! Those are true words and sometimes we all need a little nudge in the right direction…thank you kindly! I’ve always wanted to try dirty rice, but the ones I’ve had have been tooooo spicy to enjoy the taste of it! I’ll have to give this a try. Sorry to hear your birthday/valentine cabin plans didn’t work out. My family thought I needed “Wii Sports Resort” for MY birthday . . . what a line! LOL! I just asked for the snow to stay . . . and it did. You are more than the recipe queen, you are a gift from God. The message in your words was just what I (and apparently others) needed to hear. I think most of us are guilty of wishing our lives away. Keep up the good work, and by the way, the recipe sounds great, I can’t wait to try it. I’ve never heard of dirty rice but it looks good, and so easy! I’m glad you all were safe during the snow.